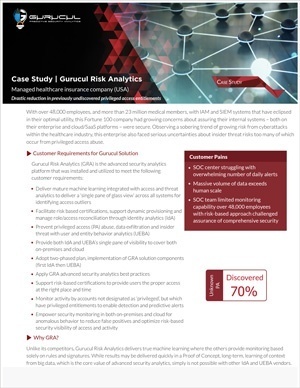 Read this Gurucul customer case study to understand how a Healthcare provider achieved a drastic reduction in previously undiscovered privileged access entitlements. They reduced the daily alert volume from 30,000 to 10 alerts, reduced password usage by 80% and so much more. Please fill out the form below to receive this case study. The Healthcare case study will be sent to the email address you provide.